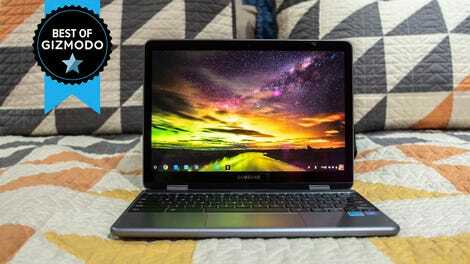 The next generation of Samsung's very nice budget chromebook. It's nearly perfect in every way. The processor can be sluggish. That second camera is silly! That 12.2-inch display is also maybe the best looking display you can get in a 12-inch or larger laptop at this price. Typically sub-$500 laptops have dim displays with terrible viewing angles. If you’re watching a movie and sitting anywhere but dead center, the display seems to go dark. 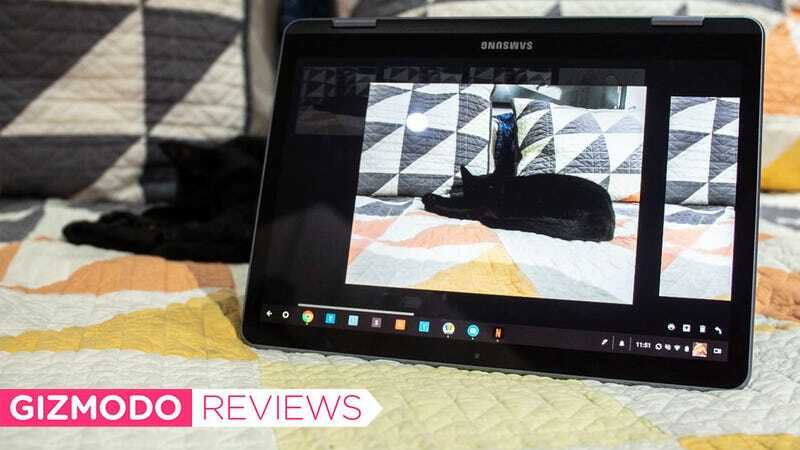 But the Chromebook Plus has a vibrant screen—though like Samsung’s phones it’s a little too saturated. That won’t be a problem for most people, but if you need absolute color fidelity because you’re a web designer or an artist, then you shouldn’t plan on relying on the Chromebook Plus’ display. But I don’t think the Chromebook Plus is for people who need super precise color rendition. It’s a chromebook! Chromebooks are for students and people who don’t need a lot of fire power. They’re supposed to be good enough for most tasks—not perfect for all tasks. The colors or vibrant, but maybe a little TOO vibrant. At 7 hours and 42 minutes of battery life when streaming a video with brightness set to 200 nits, it’s got enough juice to do the tasks you demand of a Chromebook too—though it’s not gonna wow people (the Google Pixelbook lasts more than an hour longer). It’s serviceable. And at this price point that strikes me as ideal. I’m happy to sacrifice a little speed for a laptop that doesn’t scream it’s a budget device—you know, like the ones with cheap plastic exteriors, ugly displays, floppy hinges, and keyboards that seems to flex with every press. When I prop the Samsung on my lap and read a comic in Comixology or play a few minutes of Fallout Shelter, I don’t notice that lackluster processor. I just appreciate the big display and how light but solid the Chromebook Plus feels in my hand.